South Sudan has demanded that Sudanese troops withdraw from a border town in Unity state, which the army spokesman said was occupied over the weekend. Philip Aguer told the BBC Jau was in South Sudan and warned such aggression could no longer be tolerated. He said Sudan's planes were bombing the area "causing a massive displacement of the civilian population". 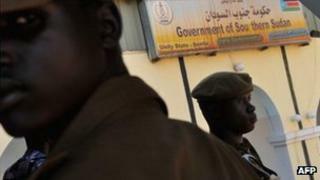 The fighting is believed to be linked to the recent clashes in Sudan's bordering state of South Kordofan. Khartoum and Juba accuse each other of supporting rebels in the border areas and over the weekend Sudan's military said it had captured a key rebel base in South Kordofan. The border between the north and south has not been officially designated since South South gained independence in July. "We have specifically demanded that Khartoum immediately withdraw from Jau, that they release the SPLA soldiers taken prisoner," Col Aguer said. "We also demanded that Khartoum cease acts of aggression that may escalate the situation and drag the two states to the brink of conflagration," he said. He also urged for the UN and other bodies to push for the final demarcation of the border as this was being used as an excuse by Khartoum "to invade some of the territories that are deep inside South Sudan". "And [as] for the international community, we ask them to exert more pressure on the government of the Republic of Sudan to respect the sovereignty of South Sudan and its territorial integrity." Col Aguer said the occupation of Jau took place on 3 December when southern soldiers had been in their barrack. It was the latest in a series of violations by Sudan's armed forces along their common border, the military spokesman said. The Sudanese military said the camp it destroyed on Saturday belonged to the Sudan People's Liberation Army North (SPLA-N) in South Kordofan in a strategic area which was "the gateway to the south". The SPLA-N fought for the creation of South Sudan during the country's long civil war, in which some 1.5 million people died, and was left in the north when the south gained independence. Col Aguer said information about the clashes in the remote area were still coming out and a clearer picture still needed to emerge about the number of people displaced.